the Blackstone Valley since 1937. Since 1937, the name Dauphinais has been synonymous with quality and service in the ready mix concrete industry. We are please to announce the return of the Dauphinais name as a concrete supplier to the Blackstone Valley and Worcester County areas. Our team has over 100 years of collective experience in the industry and we look forward to building a lasting relationship with you. Dauphinais Concrete offers complete residential and commercial ready mix concrete for poured foundations, walls, driveways and sidewalks, flowable fill, and more. We delivery Monday - Saturday. Call us today for a free estimate! Concrete can get expensive, so it pays to know how much you will need for your project. Use our calculator to estimate the volume of concrete necessary to cover your dimensions. Keep a look out for our pink mixer on the road! 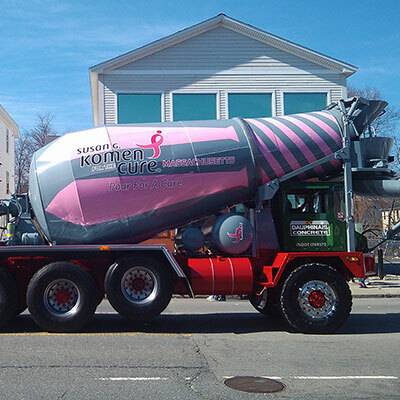 A percentage of the proceeds poured by our Komen truck are given to Susan G. Komen of New England.